In 2008 I was shown this forgotten gem by a real estate agent-friend. 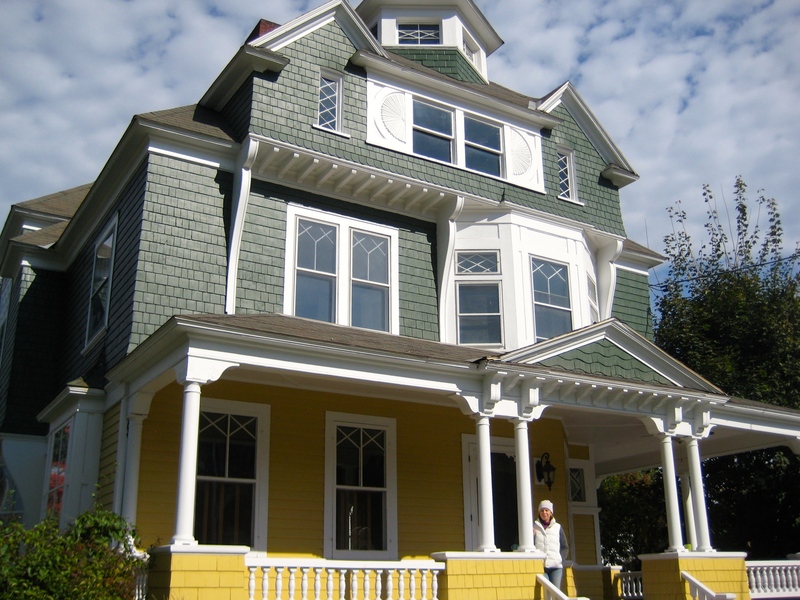 The Queen Anne-style Victorian had been on the market for several years, and was owned by a local paper mill that was using it for storage. I mean, who doesn’t need a walk-in closet, right? Not exactly a ‘lemonade porch,’ as they say. Peeling paint, missing shingles, and broken windows told a pretty grim tale when seen from the street. 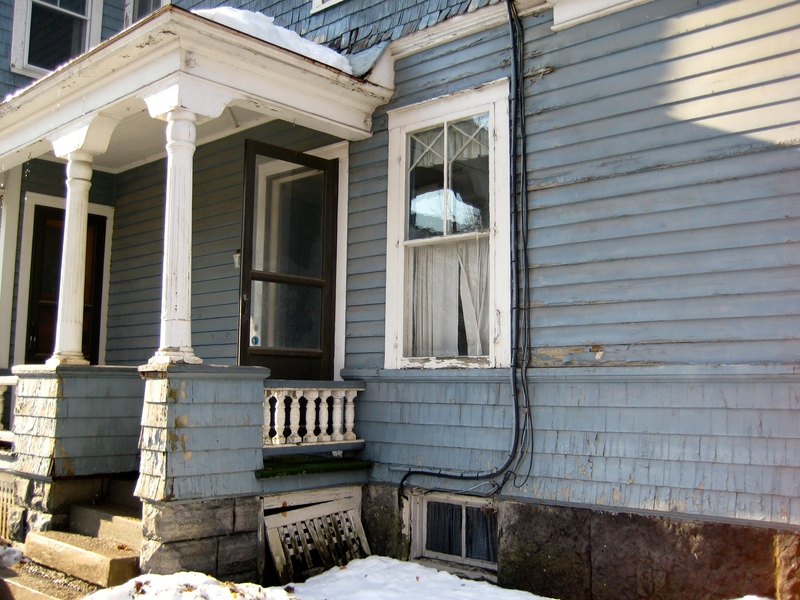 So did the sagging porch floors and rotted columns, and the visibly outdated electrical wiring. Prior to it’s stint as a glorified closet, the house had survived a few other incarnations: It had functioned as an inn many years before, and more recently it had served as dentist’s home and office. It had an eclectic history that intrigued me. And in spite of the obvious flaws and real possibilities for failure, I liked the looks of her and decided to take a walk through. Once inside, a whole other story began to unfold. 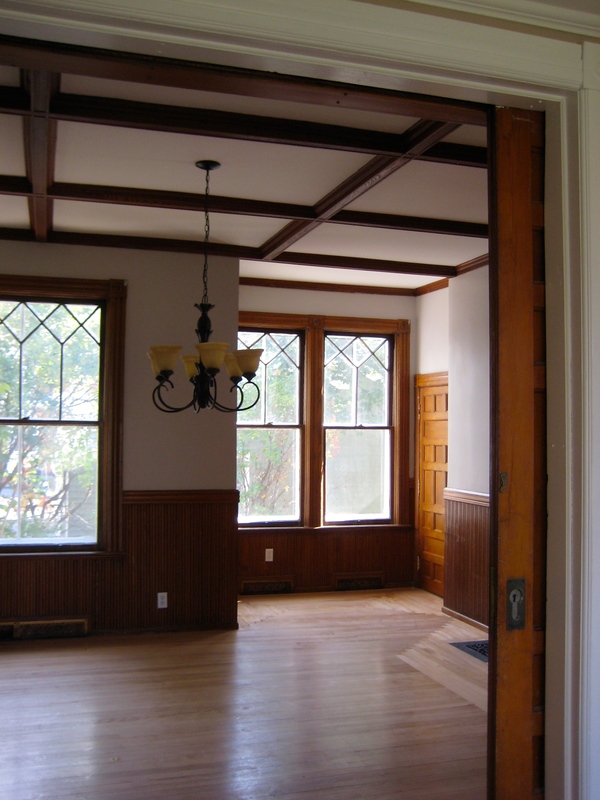 What struck me first was the light: it flooded into the house from the high, large windows, reflected by the shining hardwood floors, and traveled up into the high vaulted ceilings. Unbelievably intact woodwork, gleaming as if it was freshly varnished, graced the walls, doorways and window casings. Stately pocket doors still rolled smoothly back on their bearings. More surprises followed. 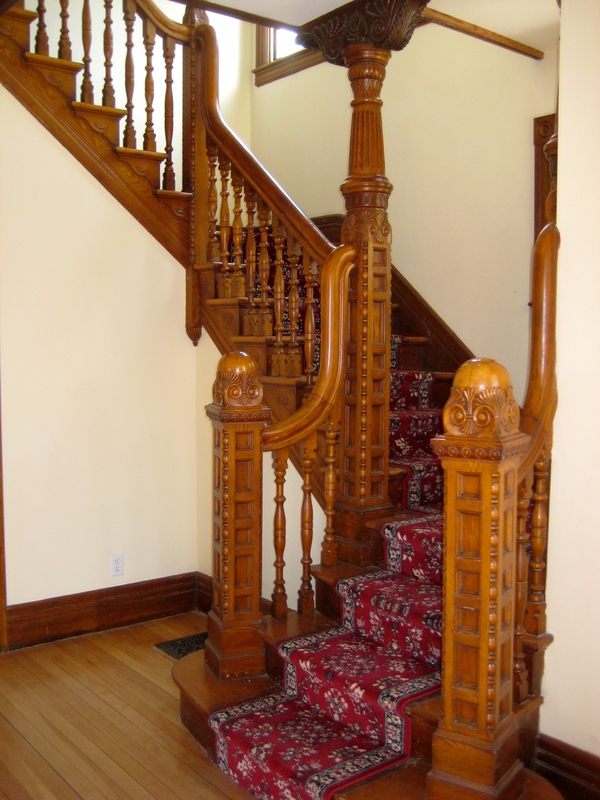 The staircase in the front entry hall was a showstopper, carved with scrollwork from top to bottom. Except for it’s faded blue carpet, it appeared as if no one had laid so much as a finger or footstep on it in ages. Stained glass windows I hadn’t noticed outside revealed themselves, painting bright, cheerful floral and geometric patterns on the floors. From it’s days as an inn, tiny gold numbers still marked the upstairs bedroom doors. Each room had its own lovely marble-topped sink complete with dainty pewter fixtures. 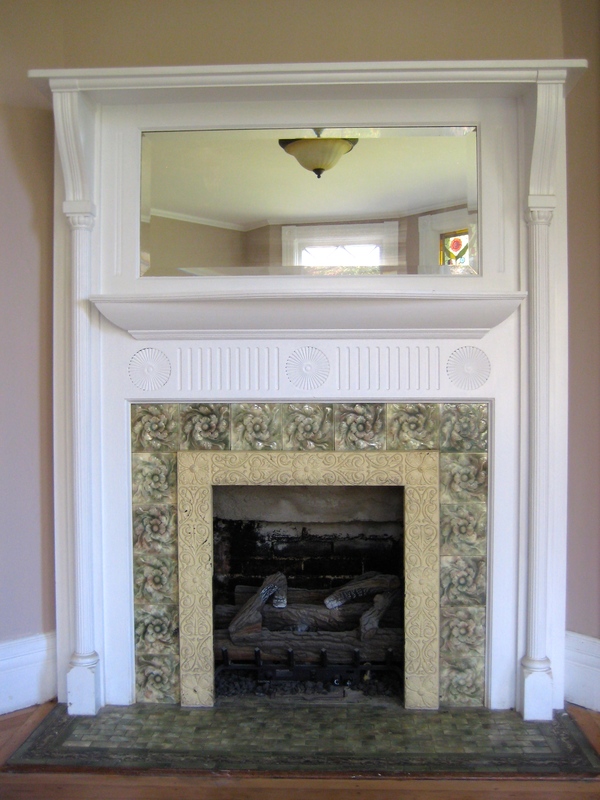 Then I there were the fireplaces. Surrounded by carved mantels and intricate ceramic tiles, each one was unique. They were closed off and hadn’t been used in years, but I was blinded to function by their lovely forms. Down in the basement, the electrical system turned out to be relatively new, with a massive fusebox befitting such an old, three-floored home and it’s previous commercial use. The foundation of tightly laid stone walls was as dry and solid as any newly constructed home. Pretty impressive for being over a hundred years old! From top to bottom it seemed, the house appeared to be excellent shape with mostly cosmetic work to be done. Old houses truly resonate with me. I can’t help but love (most of) them. I always imagine all the people that have passed in and out, have lived, loved and died there. I have never met one that frightened me, as least not yet. This house, in fact, felt quite the opposite. Everywhere inside there seemed to be warmth and light. I felt invited, welcomed. Maybe it was the height of the ceilings or the openness of the floorpan. Whatever the source, the house, I realized, was still very much alive. It was like opening a dusty old shoebox and finding sunshine and rainbows inside. Of course, not everything was so stunning. 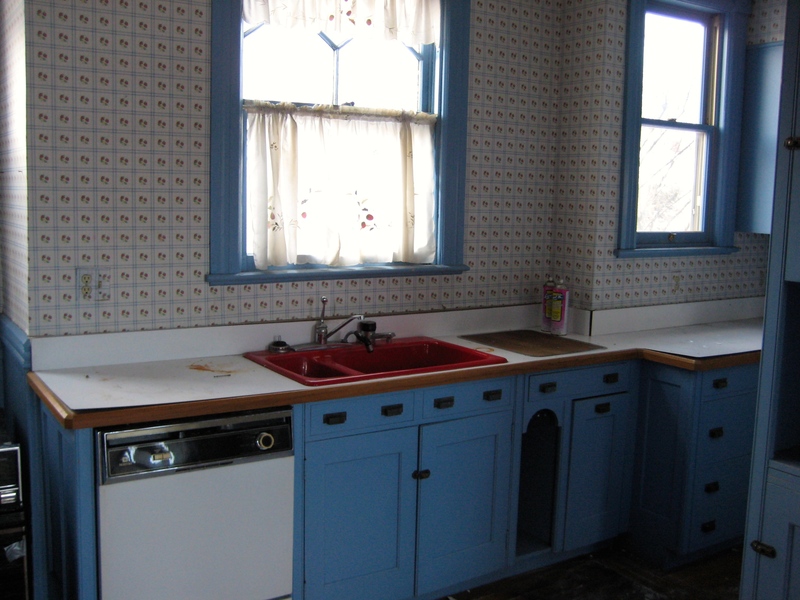 The kitchen was a mess, a large one, poorly laid out and filled with chalk-blue cabinetry. The removal of layer upon layer of flowery (and I’m sure once lovely) wallpaper would be endless. Marks on the floor where a behemoth of a dental chair once would take hours of painful and messy sanding to get rid of. 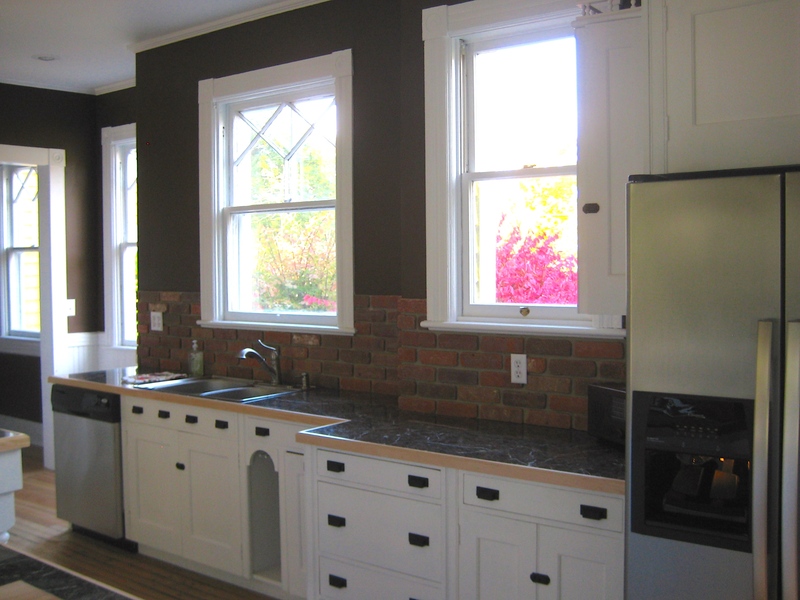 The old kitchen – eek! Promising as it was, 5,000 square feet is a pretty intimidating number. 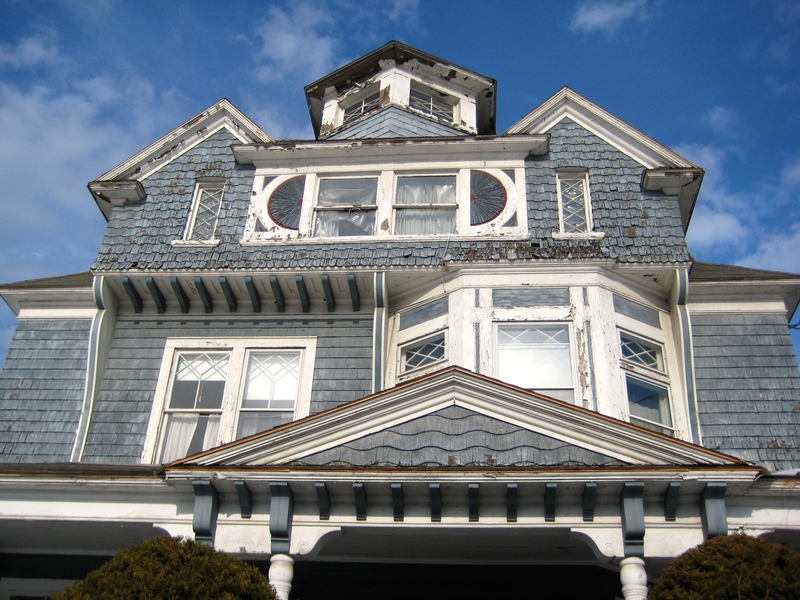 With three stories, five bedrooms, and almost as many bathrooms, the house was quite a monster. My idea was to convert it into a bed & breakfast, much like in one of it’s past lives. I had the fleeting thought that I might be getting in over my head: But hey, it was pretty cheap. And I had always been a sucker for a lost cause. The reality was, deep down I identified with the house: I saw myself in it. On the surface, it appeared less than glamorous. It was alone, abandoned, neglected and had been so for years. No one saw any value in it anymore. At that time in my personal life, I was feeling the exact same way. Fortunately, I’m self-aware enough to realize I might have been anthropomorphizing it a bit. So, after some careful attempts at realistic calculations of the numbers (i.e., money) involved, I decided it was worth the risk. I just knew I had to save her. The grand old lady and me, finished at last! Well save her, I did, with a lot of professional help, of course. I feel very much like a proud parent. Now she is back to her former glory (minus the flowery wallpaper) and with modern improvements. Each bedroom has its own full bath this time, and the revamped kitchen would make any cook happy. All the cabinetry was saved, simply repainted. 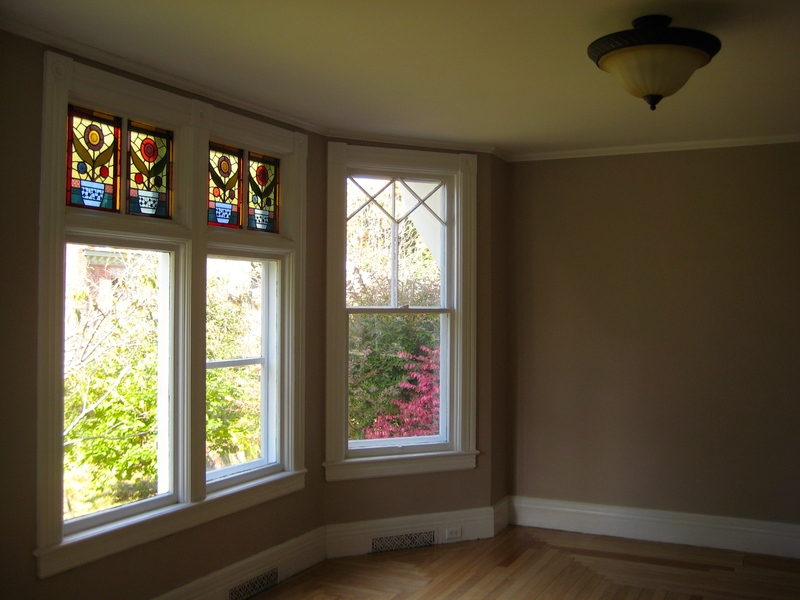 And all the lovely, original wooden windows remain (even if they are a bit drafty). 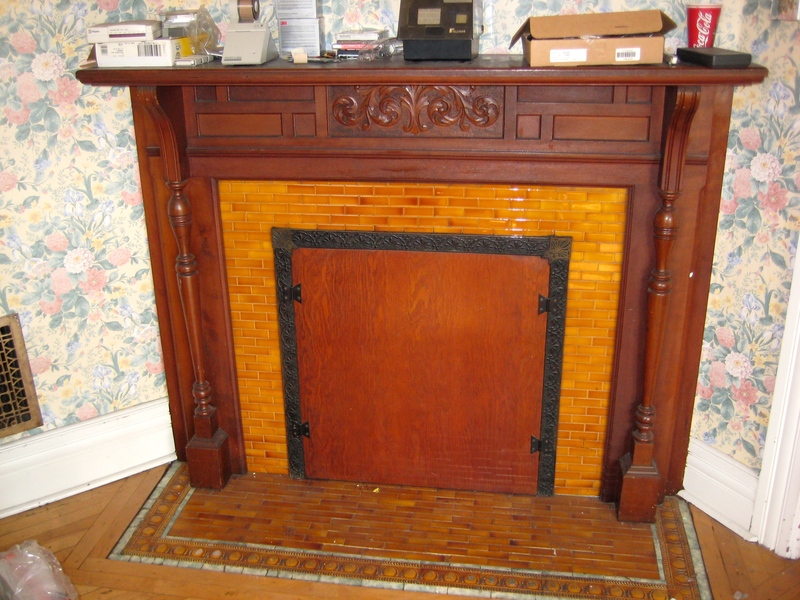 The fireplaces were reopened and now burn convenient gas logs. A useful butler’s pantry was created next to the kitchen from one of the downstairs baths. Laundry can now be done on the first floor, thanks to an old coat closet. We even managed to save the old marble sink tops and used them here and there throughout the house: One became a cutting board for the kitchen counter, the others were made into bathroom thresholds. It’s fun to recycle! Although I was (and still am) thrilled with how the house turned out, my timing with the bed & breakfast idea was pretty off. By the time renovations were complete, the financial crisis of 2008 had hit hard and launching into that type of business didn’t make a whole lot of sense for me anymore. 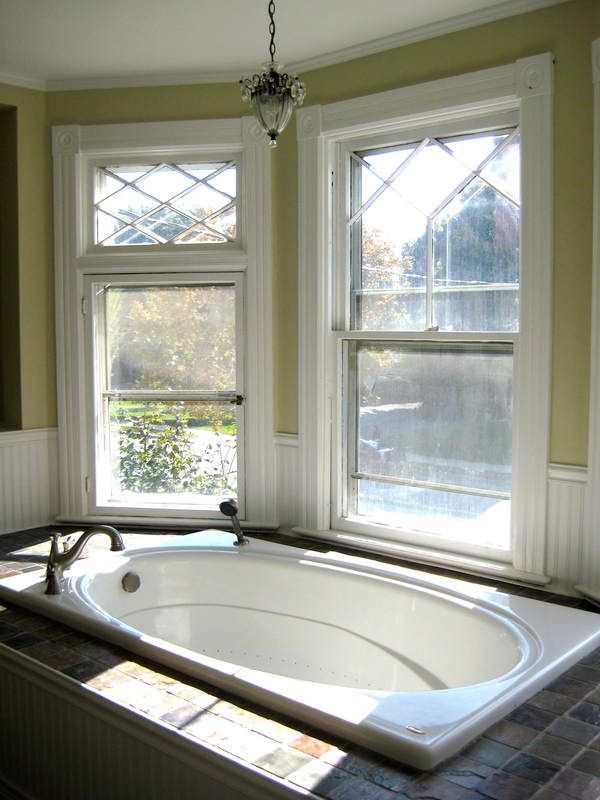 A small, oddly placed bedroom converted to a bath for the master-suite. So I rented out the house – quite fortunately for both of us – to a family who had been forced out of their previous home due to the same circumstances that had affected my decision. They have lived there and taken wonderful care of the house ever since. So although I don’t live there, never did, and probably never will, I can still appreciate and enjoy the house as an artistic project, one that now benefits others, as well.